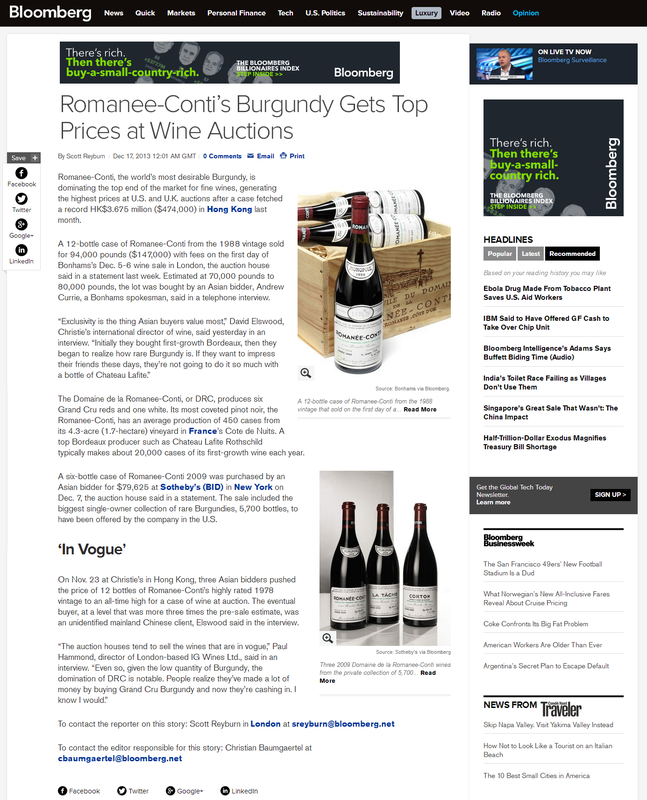 Romanee-Conti, the world’s most desirable Burgundy, is dominating the top end of the market for fine wines, generating the highest prices at U.S. and U.K. auctions after a case fetched a record HK$3.675 million ($474,000) in Hong Kong last month. A 12-bottle case of Romanee-Conti from the 1988 vintage sold for 94,000 pounds ($147,000) with fees on the first day of Bonhams’s Dec. 5-6 wine sale in London, the auction house said in a statement last week. Estimated at 70,000 pounds to 80,000 pounds, the lot was bought by an Asian bidder, Andrew Currie, a Bonhams spokesman, said in a telephone interview. The Domaine de la Romanee-Conti, or DRC, produces six Grand Cru reds and one white. Its most coveted pinot noir, the Romanee-Conti, has an average production of 450 cases from its 4.3-acre (1.7-hectare) vineyard in France’s Cote de Nuits. A top Bordeaux producer such as Chateau Lafite Rothschild typically makes about 20,000 cases of its first-growth wine each year. A six-bottle case of Romanee-Conti 2009 was purchased by an Asian bidder for $79,625 at Sotheby’s (BID) in New York on Dec. 7, the auction house said in a statement. The sale included the biggest single-owner collection of rare Burgundies, 5,700 bottles, to have been offered by the company in the U.S.
On Nov. 23 at Christie’s in Hong Kong, three Asian bidders pushed the price of 12 bottles of Romanee-Conti’s highly rated 1978 vintage to an all-time high for a case of wine at auction. The eventual buyer, at a level that was more three times the pre-sale estimate, was an unidentified mainland Chinese client, Elswood said in the interview.